What happens when competition watchdogs lose their teeth – and roll over to have their tummies tickled? Via the influential chair of the Commons Culture Media and Sport Select Committee, John Whittingdale MP, comes a very interesting story today. Whittingdale relates a conversation with John Fingleton, the head of the Office of Fair Trading. The MP asked if the agency had looked at the question of Google’s power in the marketplace. Google has a dominant market share of paid search advertising, effectively setting the price of doing business on the internet for small companies. The conversation took place at around the time it became known that the European Commission began to probe the company, and its customers, in response to a series of complaints. The FTC opened its own investigation this summer. “The head of the OFT told me that Google was a fantastic organisation, a fast developing company, and should be applauded,” the MP said. The job of a business regulator, we hardly need point out, is not to swoon like a gushing schoolgirl delighted that a boy band star has swept into town. Fingleton had also offered his views – although a little more circumspectly – to The Guardian newspaper, in November 2009. Obama’s “regulation czar” Professor Cass Sunstein wants animals to be able to sue. Animals can’t reason or express themselves, naturally, so the litigation would be handled by human lawyers, acting as ventriloquists on behalf of the animal kingdom. 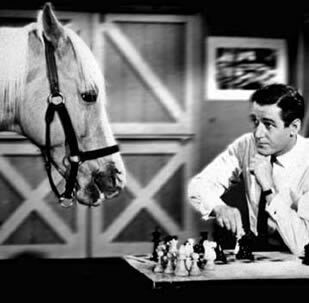 Think Mister Ed the talking horse, crossed with Eliot Spitzer. “Any animals that are entitled to bring suit would be represented by (human) counsel, who would owe guardian-like obligations and make decisions, subject to those obligations, on their clients’ behalf,” according to Sunstein. The Harvard legal scholar first proposed the argument in 2002. “This doesn’t look good for hunters, ranchers, restaurateurs, biomedical researchers, or ordinary pet owners,” says the food industry lobby group The Center for Consumer Freedom, which raised Sunstein’s radical “rights” agenda. In Spain, activists have already proposed that apes be granted human rights. Europe’s most powerful quango, the European Commission, says it wants to accelerate a “single market” for online music, film, and games – and is threatening legislation to bring it about. Although the EU’s Telecoms commissioner Viviane Reding sees the market for digital entertainment quadrupling (to €8.3bn by 2010), she feels the bureaucrats need to get involved anyway. In a statement issued yesterday, the EC identified four areas for action – with the most ominous being a good behaviour pledge for online service providers.